Delicate blooms scatter over this snuggly scarf. Romantically feminine for an adult, girly soft for a child. 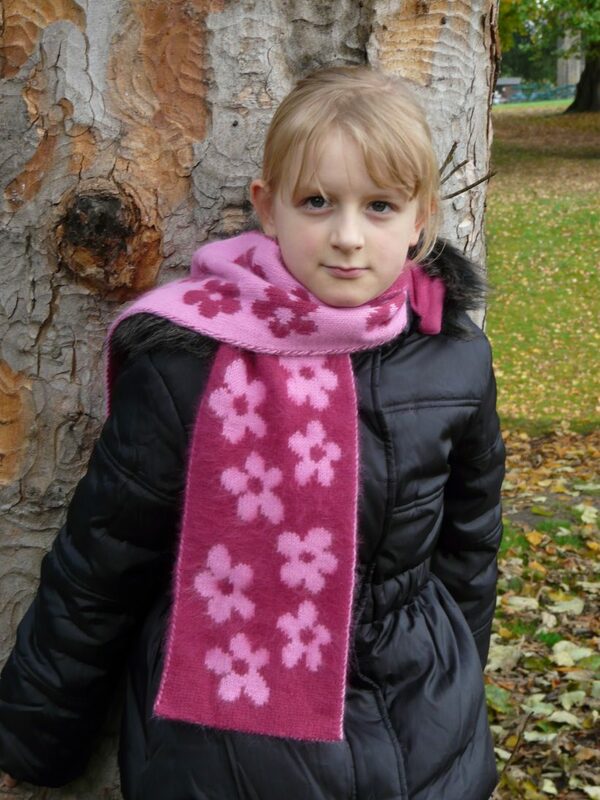 The scarf is worked in double knitting, thus it is fully reversible with each side being a negative of the other. It is knitted on 3mm/US 2½ needles at a tension of 28 stitches and 36 rows to 10cm/4″ on each face of the double knitted stocking stitch. The pattern links to relevant internet resources for the special techniques involved. These include the illustrated article I have written about double knitting, and a YouTube video of the seamless cast-on used in the pictured sample. The pattern is easily adapted for child and adult sizes. Materials required are 230-310 metres/250-335 yards each of two complimentary colours of a DK weight angora blend yarn.